At London Sound Academy we have the highest student success rates for any DJ school or academy based on the number of gigs we organise for our graduates and the shear volume of competition winners in our ranks. DJ’s at LSA are given the platform they need to then move on and organise their own DJ gigs and launch themselves into the music business. 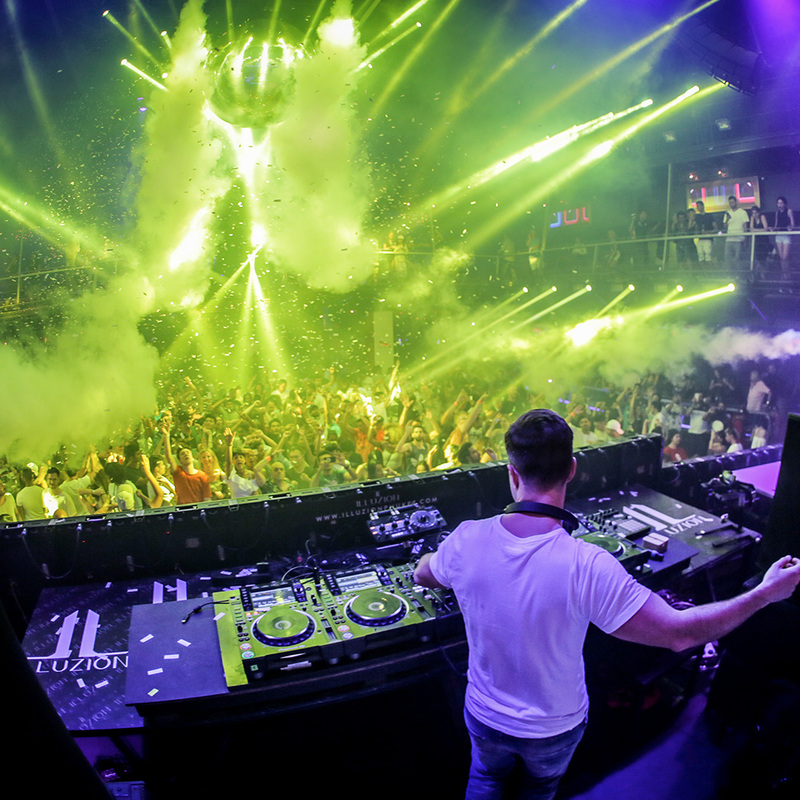 This week we report on an incredible student success story from Daley Young, aka Daylight, on his recent headline gig at Illuzion in Phuket, Thailand. Read on to learn all about Daylight, their journey at LSA and what the future holds! Daylight - One to watch! Daylight is about to release his debut track together with fellow LSA graduate GOLLO featuring the amazing vocals of Elle Vee. Watch this space for future news on this upcoming artist! Illuzion is a 5000 capacity club in the party island, Phuket, Thailand. Nestled within Phuket's tropical paradise you’ll find an astonishing club, now ranked 48 in the world’s top 100 clubs, a ranking organised by DJ Mag. They pride themselves on their high production value including cutting-edge lighting and sound, visuals and choreographed dancers. Recent headliners include Martin Garrix, Marshmellow, Sven Väth, Nervo, Markhese and our very own Daylight, as reported here. Headliners at the club get treated with the full VIP experience including personalised club visuals on huge LED screens, promotion throughout local media both print and online, press shots on flyers, lanyards and other printed materials and the full AAA backstage experience. Daylight’s Journey - From the bedroom to the main room! 1. What brought you to LSA to learn how to DJ? I first started learning on my own with an online course but i quickly hit a ceiling and wanted more professional mentorship. My wife then bought me a lesson with a another school in London for my birthday present, but they were so unprofessional, had a moody instructor and had nowhere to go on completion. Thankfully I started searching again and came across LSA and checked out all the positive reviews on Facebook and had to join. It's the best decision I've made and I loved every second of my training with both Noah and the other tutors at LSA. Such lovely positive people who didn’t make you feel inferior and always had smiles on their faces. 2. How long did it take you to become confident on the decks? I became confident with a controller very early on, but it’s just not proper DJing in my opinion. Matching up lines on a screen just takes the fun out if and you can't use a basic DJ controller at a serious DJ gig. The true beat-matching craft takes way longer to master but my method was lots of practice and recording my own mixes then listening back to them. I would listen to the big pro’s and their mix tapes online and then make sure mine would be just as good. I think with all the years of raving behind me it didn’t take long for me to be confident on the decks. But my advice would be take any gig you can in the early days. I started out doing trampoline discos and any gig I could hold off in the beginning, playing in front of people was a great confidence builder. Obviously the real confidence came when I started successfully playing to busy rooms at the Ministry of Sound on LSA nights. 4. Once you finished the course at LSA did you do any gigs with us? How many did you do and which ones are the best ones? Since completing the course with LSA I have played Ministry of Sound Loft and BabyBox around fifteen times now. Two LSA boat Parties, Roadtrip, Golden Bee and a music festival. By far my favourite gigs are the BabyBox Ministry of Sound ones where I have now built up a following and together we create a proper buzz in the room. I'm lucky to say I have played to a packed room a few times now which I am proud of! 5. What’s the best part of LSA? For sure the great teachers and the fact they give you exposure into these amazing venues when starting out. Without this you would find it extremely difficult to play in public for sure, so it's priceless. 6. What's next for Daylight? Well it seems to be escalating beyond my dreams. I have just returned from headlining a DJ Mag no 48 club in the world, playing main stage to 4,000 people. I am working with my buddy GOLLO (another LSA graduate) on a few new tracks which we hope will be getting signed by a big label soon, so watch this space. I’m working on further big shows to come this year also. I would like to thank you all at LSA and all the people that have supported me along the way. If I could give one bit of advice it would be to always try and support others and maybe they may support you in return. It's not a competition and you can’t do it all on your own. This attitude will help in the long run and you never know where your journey will lead. Trust me! Follow Daylight Online And Support Your Fellow Alumni!